Louis Welden Hawkins (1849–1910), The Eiffel Tower as Seen from The Trocadero (c 1899), oil on canvas, 55 x 45 cm, Musée d'Orsay, Paris. Wikimedia Commons. I’ll admit that, until a couple of weeks ago, I had never even heard of Louis Welden Hawkins (1849–1910), nor can I recall seeing any of his paintings, although some are in the Musée d’Orsay. As even the great Wikipedia knows next to nothing about him, allow me to cast a little light on his life and work. Louis Hawkins was born in Germany, the son of a British Naval Officer and an Austrian Baroness. He grew up near London, and at the age of fifteen he followed in his father’s footsteps by joining the Royal Navy. He then decided that he wanted to be a painter, so left the Navy and settled in Paris in around 1870, to begin his training. He started at the Académie Julian, where he was taught by Jules Lefèbvre and William Bouguereau, and in 1873 made friends with George Moore, an Irish writer who also attended the Académie. Hawkins seems to have been quite poor at the time, and had to work painting porcelain in a factory to make ends meet. He persevered, apparently painting in a conventional academic (Salon) manner, as may be expected given his teachers. In 1876, he was admitted to the Académie Nationale des Beaux-Arts, where he was taught by Gustave Boulanger. Louis Welden Hawkins (1849–1910), A Peasant Woman (c 1880), further details not known. Wikimedia Commons. 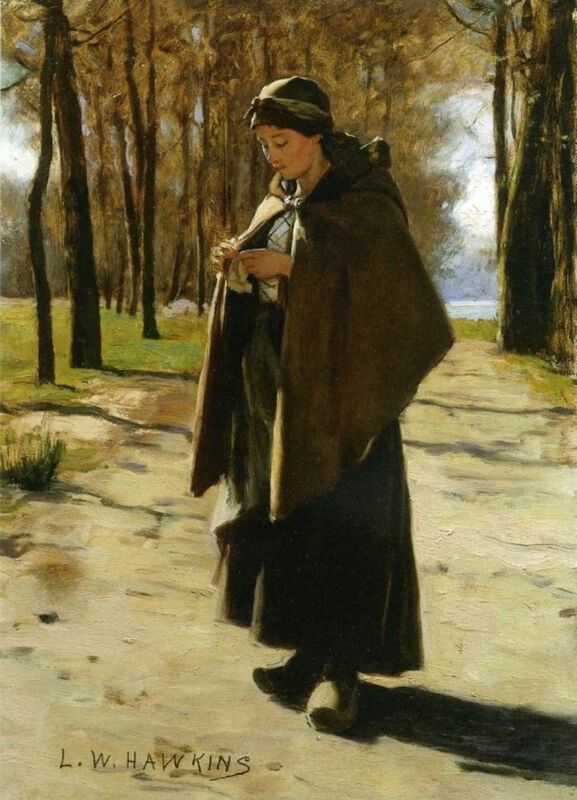 By about 1880, when he painted A Peasant Woman, Hawkins had left Paris for Grez-sur-Loing, which is close to Barbizon and was still very rustic at that time. There he painted rural scenes in a style strongly reminiscent of Jules Bastien-Lepage, who was only slightly older than Hawkins, and making a great impression at the Salon. Louis Welden Hawkins (1849–1910), Orphans (1881), oil on canvas, 125 x 160 cm, Musée d’Orsay, Paris. Wikimedia Commons. 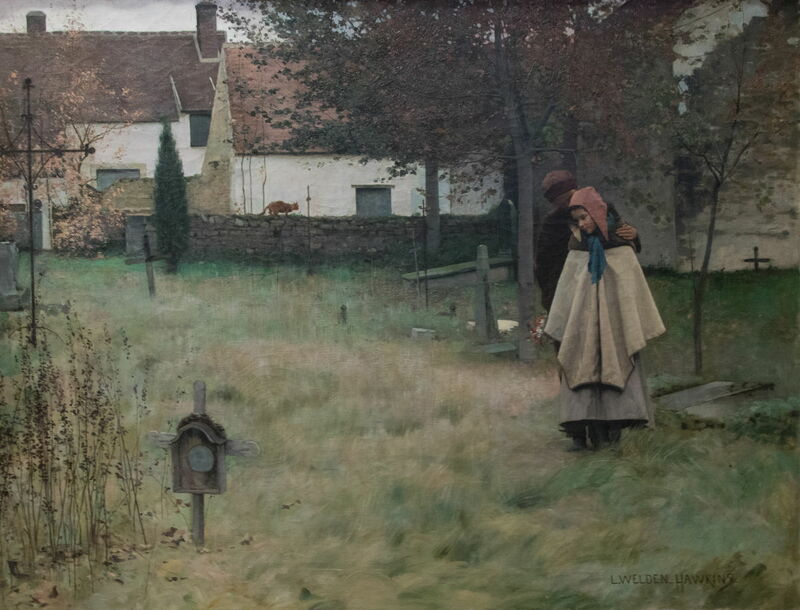 Hawkins’ first success came with Orphans (1881), which shares Bastien-Lepage’s somewhat muted colours, which are attributed to the light peculiar to Grez. A young brother and sister are in a neglected graveyard, looking together at a pauper’s grave, apparently of one or both of their parents. This painting was awarded a third-class medal at the Salon that year, and marked the start of a run of his paintings exhibited at the following three Salons. This work was purchased by the state in 1887 for 10,000 francs, and was also exhibited at the Paris World Exhibition in 1900. Louis Welden Hawkins (1849–1910), The Last Step (c 1882), oil on canvas, 129.5 x 83.8 cm, Owens Art Gallery, Mount Allison University, Sackville, Canada. The Athenaeum. 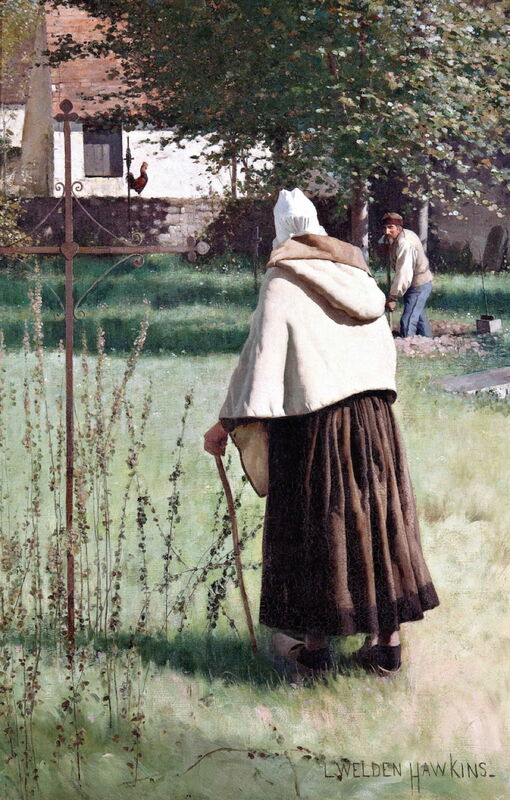 Hawkins continued this style in The Last Step (c 1882), which shows an elderly woman walking slowly with a stick in what may be the same graveyard. In the distance, a gravedigger is digging a new grave through the stony soil. The two engage in conversation, probably discussing where she will be buried in the not too distant future. Louis Welden Hawkins (1849–1910), The Priestess (c 1890), further details not known. Wikimedia Commons. During the late 1880s, Hawkins turned away from the naturalism of Bastien-Lepage (who had died suddenly in 1884), and became more symbolist. In 1887, he asked Pierre Puvis de Chavannes if he could work in his studio, but was turned down. 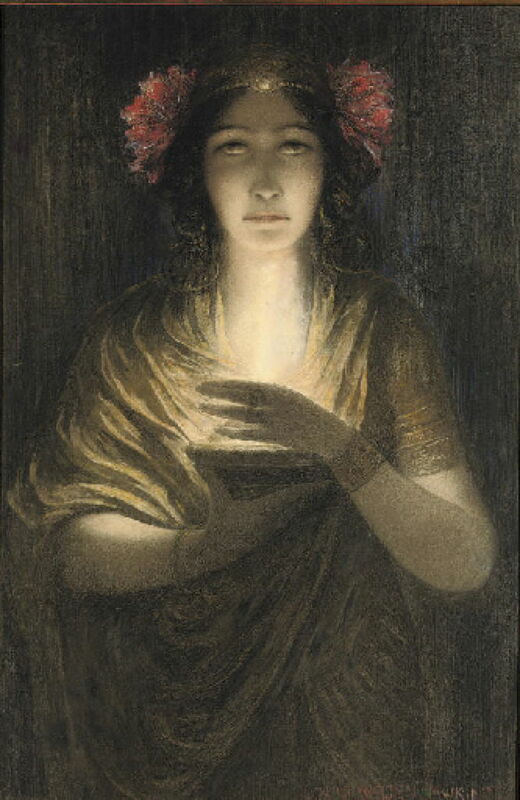 The Priestess (c 1890) shows the dramatic change which had occurred in Hawkins’ themes and style over those years. In about 1890, Hawkins met Raffaela Zeppa, an Italian woman; the couple lived together, their daughter being born in 1892. They married in 1896, after Hawkins had adopted French nationality (in the previous year). In 1891, Hawkins broke with the ‘official’ Salon de la Société des Artes Français, and switched to its counterpart, the Salon de la Société Nationale des Beaux-Arts, a move which brought him renewed success at last. 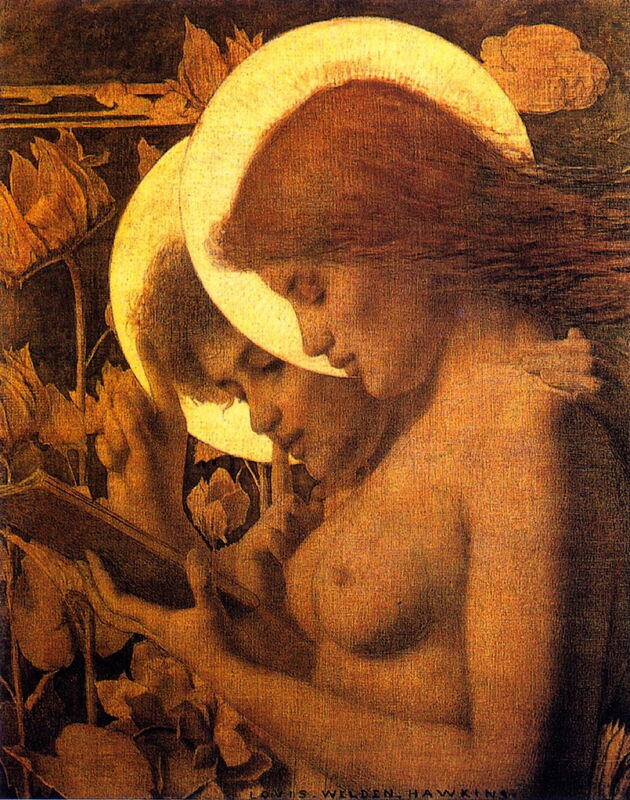 Louis Welden Hawkins (1849–1910), Les Auréoles (Haloes) (c 1891-94), oil on canvas, 61 x 50 cm, Private collection. The Athenaeum. 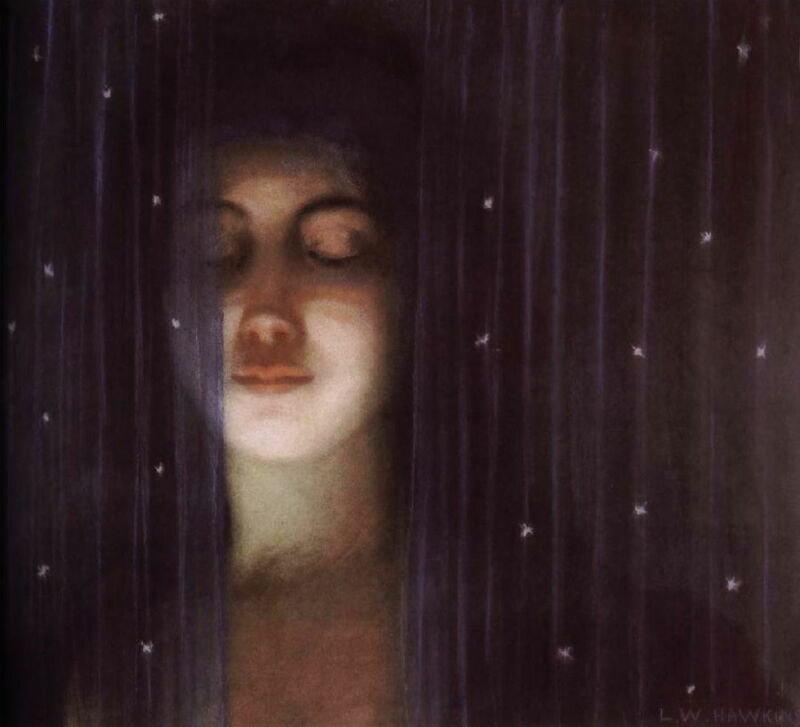 Les Auréoles (Haloes) (c 1891-94) was shown at Symbolist exhibitions, where it was interpreted as depicting the duality of woman as both femme fatale and femme fragile. 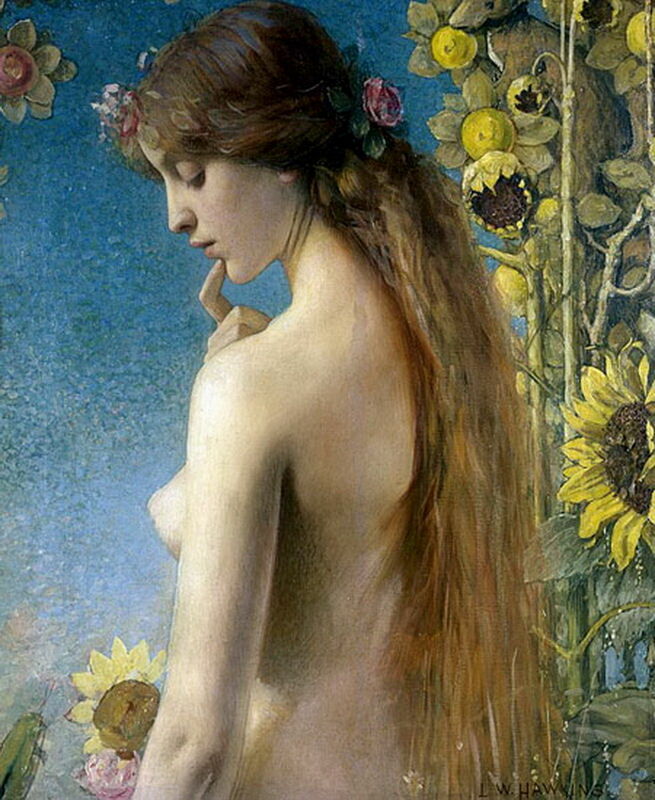 Although undated, I suspect that Hawkins’ wonderful painting of Clytie dates from around this time, and his distinctive confluence of Impressionist handling of colour with Symbolist motifs. 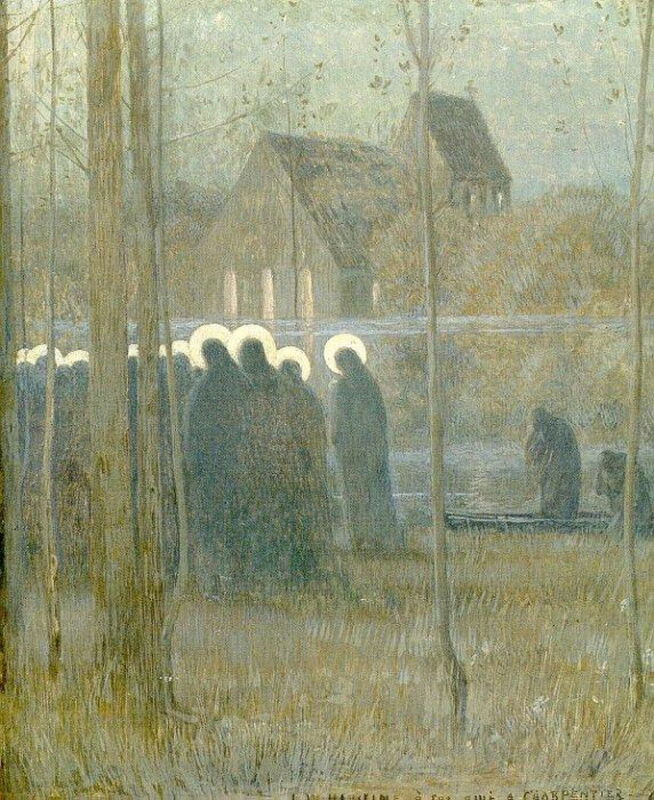 Louis Welden Hawkins (1849–1910), The Procession of Souls (1893), oil on canvas, 64 x 44 cm, Private collection. Wikimedia Commons. The Procession of Souls (1893) was dedicated to the successful sculptor Alexandre Charpentier, who was a close friend. It shows a group of figures with haloes walking slowly along a riverbank, as two cloaked boatmen wait in their small boat on the river – suggestive of Charon on the River Styx. On the opposite bank is a chapel, its windows lit up in the gloom of the half light. Louis Welden Hawkins (1849–1910), Portrait of Séverine (1895), oil on canvas, 77 x 55 cm, Musée d’Orsay, Paris. Image by Sailko, via Wikimedia Commons. Back in 1888, Hawkins had lived for a while with Camille Pelletan, a radical socialist politician, and he continued to move in radical circles. 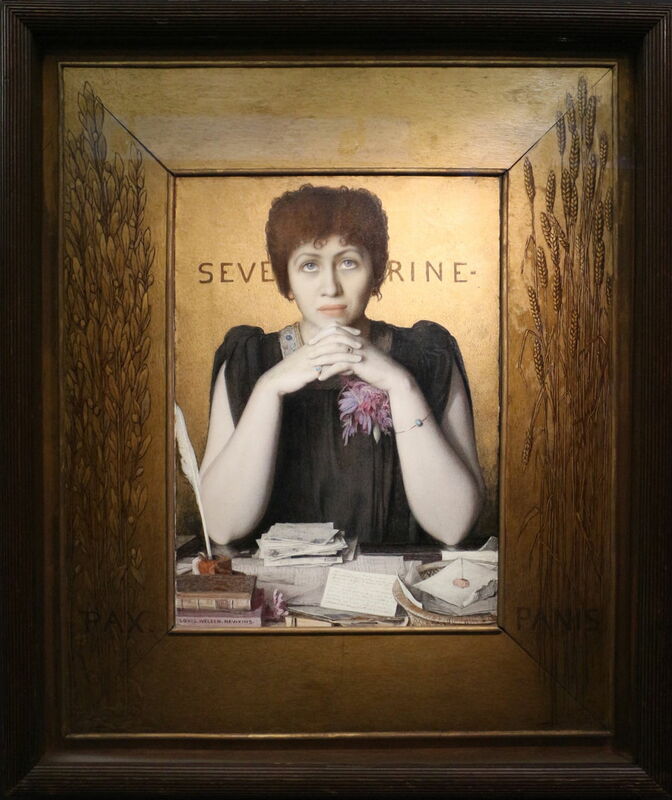 His Portrait of Séverine (1895) shows a popular journalist, who was then at the height of her fame. Séverine’s original name was Caroline Rémy (1855-1929), and she was a famous defender of humanitarian causes. During the First World War, she sided with anarchists and protested against the fighting. Hawkins made this frame himself. On its left are olive branches and the inscription PAX (peace), and on the right are ears of wheat and the inscription PANIS (bread). This work was shown at the Salon Nationale in 1895, where it was greatly admired. In the mid-1890s, Hawkins made friends with the Symbolist writers Paul Adam and Jean Lorrain, and with Stéphane Mallarmé, and through his soirées met Puvis de Chavannes, Odilon Redon, and Claude Monet. Hawkins’ work was particularly popular in the Symbolist movement, with its controversial leader Joséphin Péladan, and at its Salon de la Rose + Croix. 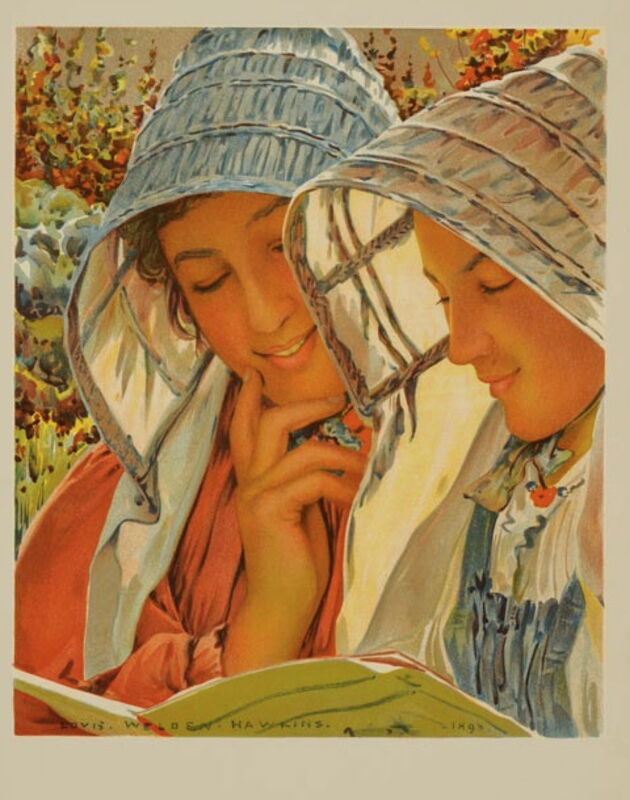 Louis Welden Hawkins (1849–1910), Readers (1897), lithographic print from L’Estampe moderne, vol. I, Paris, F. Champenois. Image by Spiessens, via Wikimedia Commons. Several of Hawkins’ paintings were turned into popular prints, although I have been unable to trace any original for Readers (1897), or evidence that Hawkins himself might have engraved it. Louis Welden Hawkins (1849–1910), The Eiffel Tower as Seen from The Trocadero (c 1899), oil on canvas, 55 x 45 cm, Musée d’Orsay, Paris. Wikimedia Commons. 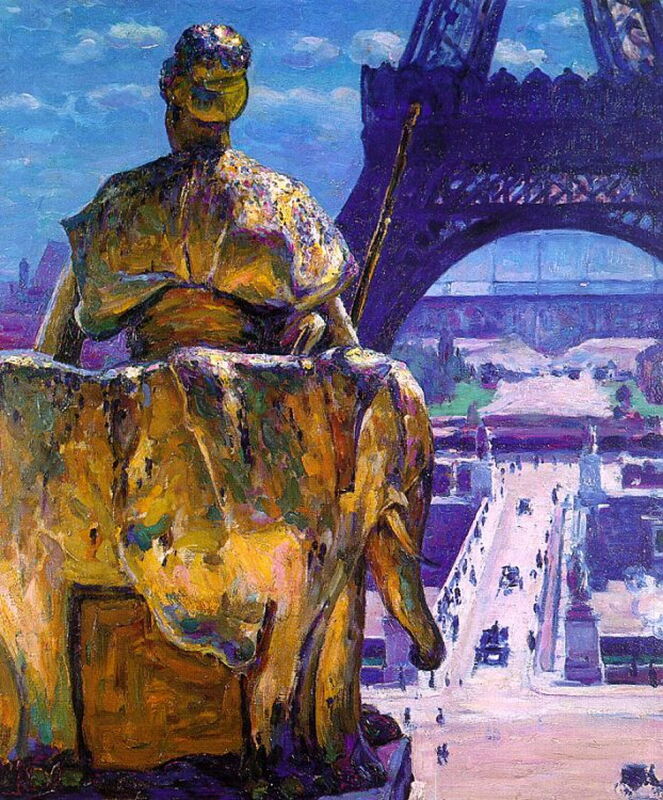 The Eiffel Tower as Seen from The Trocadero (c 1899) is one of a pair of views which Hawkins painted while the pavilion for the 1900 World Exhibition was being constructed, here seen in the distance behind the Eiffel Tower. In the foreground is the sculpture Asia, by Alexandre Falguière (1831-1900), which decorated the old Palais du Trocadero, which had been built for the World Exposition of 1878. Although the chroma of this image is perhaps slightly exaggerated, this painting is as richly colourful as it appears. 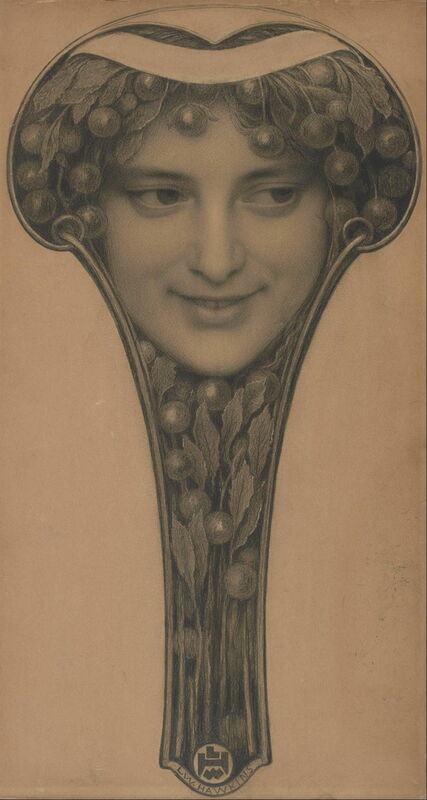 Louis Welden Hawkins (1849–1910), Mask (1895-1905), black chalk and pencil on light brown paper, 43.2 x 23.8 cm, Museum of Fine Arts, Houston, TX. Wikimedia Commons. In an effort to improve his family’s income, at the turn of the century, Hawkins turned to making masks and fans. These proved most popular at the World Exhibition of 1900, and are exemplified by Mask (1895-1905) above, which was drawn in black chalk and pencil, and Fan (1905), below, which was painted in gouache. Their art nouveau style was seen as very fashionable at the time. 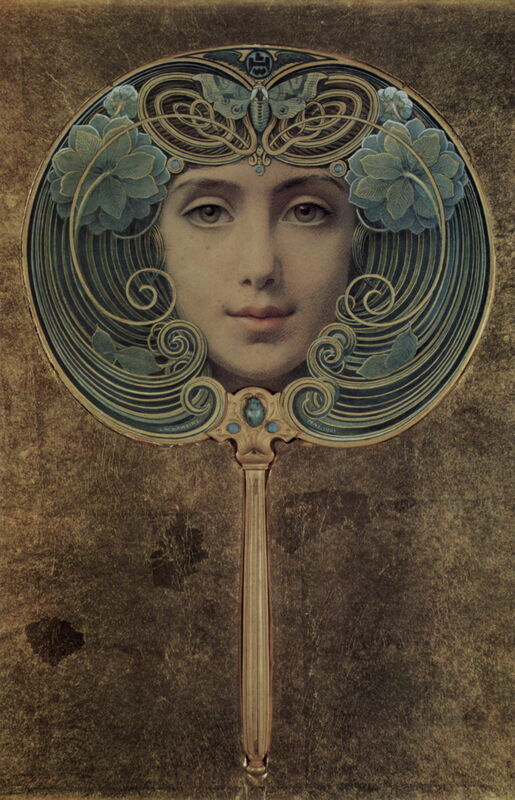 Louis Welden Hawkins (1849–1910), Fan (1905), gouache on paper, 22.8 × 28 cm, Private collection. Wikimedia Commons. 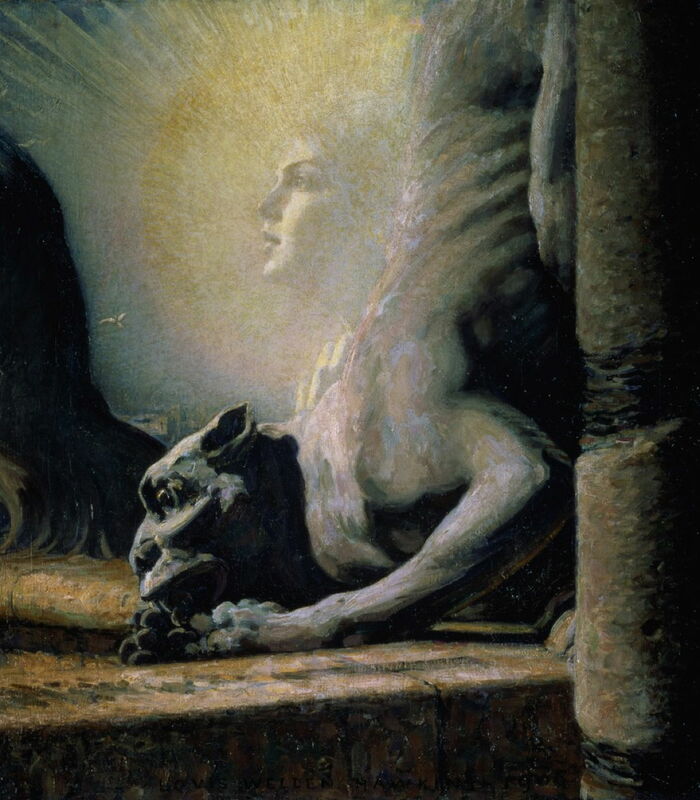 Louis Welden Hawkins (1849–1910), The Sphinx and the Chimera (1904-06), oil on canvas, 81 x 73 cm, Musée d’Orsay, Paris. The Athenaeum. The Sphinx and the Chimera (1904-06) is an extraordinary painting which draws from Hawkins’ own paintings of women, such as Les Auréoles above, with influences from Moreau and Khnopff. It is hard to distinguish the Sphinx with its radiantly beautiful womanly face, and sculpted wings from the grotesque head and body of the chimera beneath. Louis Welden Hawkins (1849–1910), A Veil (c 1890 or 1909), coloured chalk, 33 x 38 cm, Private collection. Wikimedia Commons. A Veil is a chalk drawing which shows Hawkins developing themes which are reminiscent of Odilon Redon and of pastels by Fernand Khnopff, such as his Voile series. Although it has been claimed to date from around 1890, it seems more likely that it was made in Hawkins’ final year or two, perhaps 1909. In 1905, Hawkins’ arts circles in Paris collapsed, and he and his family retired to Brittany, where he spent his remaining five years painting realist landscapes. He still returned to the city to paint watercolour views, and died there in 1910 after suffering a heart attack. His first solo exhibition took place at the Van Gogh Museum in 1993. Lucas Bonekamp (1993) Louis Welden Hawkins, 1849-1910, Van Gogh Museum. ISBN 978 90 6630 442 0. Posted in General, Painting and tagged Bastien-Lepage, Hawkins, Impressionism, Khnopff, painting, Redon, symbolism. Bookmark the permalink.